I was finally able to get Miss Whitlee on video kicking a few weeks ago and have been meaning to upload it for a while. This past week though, she has gotten a lot stronger and I got an even better video of her kicking twice in 30 seconds. You’ll have to look close because they’re still not major from the outside but you can definitely see them. Watch right under my chest near the wrinkle in my shirt…she kicks at about 4 seconds and again at about 21 seconds. This is my favorite part of pregnancy!! Weight Gain: 16 at the doctor’s office, still holding at 25 at home. They’ll weigh me again at the doctors appt. next week. 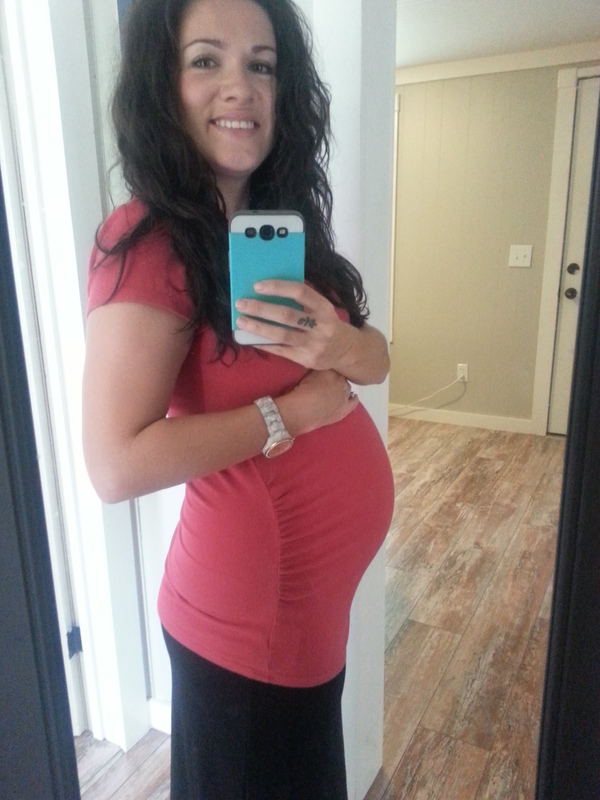 Maternity Clothes: more and more leggings. I have one pair of maternity jeans that I’ve either outgrown or they shrunk from being washed and dried so many times! Wedding Rings On or Off: On, for the reason that I don’t think I can get them off at this point! I’m hoping they don’t get any tighter or we’ll have a problem. If they feel loose any time soon, I’ll probably go ahead and take them off. I’m terrified of them getting stuck! Sleep: Still peeing a lot and having to shove a pillow under my belly all the time. I also feel Whitlee bumping around in there anytime I get up to pee and then lay back down. She’s usually awake in the middle of the night. Not keeping me awake yet though! Best Moment This Week: Winning a basket of baby goodies at a local Baby and Kid Expo! My friend Kaitlin and I went Saturday and scored some super cute clothes for her little girl and mine. I also registered for a raffle on one of several baskets being given away. They called yesterday and said I won one! I’ll post a picture when I get it! Movement: Still moving all the time. (kicking me as a type, actually!) She had a crazy active day last Friday and then we went to the Baby Expo -because get this – they were doing 3D ultrasounds for $10. What!? So we went hoping to get a look at Whitlee in 3D. Well after her crazy active day on Friday, she apparently had flipped around breech again and snuggled into my back with her face away from the outside. So my normally super cooperative, super active baby was 100% non cooperative and was sound asleep! She wouldn’t roll over for anything! She turned over on her side one time and everyone was like “WAIT! DON’T MOVE! !” and they swapped it to 3D, and then we realized the umbilical cord was all in her face, so we still couldn’t see her. We did see her in 2D and you could tell she has the cutest little lips. I can’t wait to see her in person! Symptoms: I suddenly felt very heavy this week. Like definitely feeling those 25 lbs! Also, I’ve been super lucky to not have broken out with crazy pregnancy acne (and please don’t let me wake up tomorrow with a face full!) but I have been getting little pimples on my right ear. Like a new one every week. And they’re real deal pimples, like can be popped and then they go away. I’ve had two on my ear lobe, a couple inside my ear, and now today one on the back of my ear. It is so strange! And they hurt… kind of like those super sensitive ones you get in the corner of your nose or right inside your nose. They hurt to even touch them! Noteworthy Moments: Fairly calm week. We did finally get the hardware painted on the crib and the crib skirt put on. I’m planning on doing a separate post of before nursery pictures with one sneak peak of the crib, but I’ll do a full blown nursery post in the end. It’s coming together so nicely! I can’t wait until our baby showers (I’m having two) so we can finally get everything in there and then get the room finished! Maternity Clothes: Lately it’s been sort of a mix.. maternity leggings with non maternity tank and cardigan, maternity shorts with a t-shirt.. sometimes all maternity. Belly Button In or Out: still in for now, getting so near to flat its crazy. Nolan laughs at me because I rub it constantly, but its such an odd feeling! Wedding Rings On or Off: On still for now. If Texas would cool off permanently for the fall I’d probably be able to leave them on. We’ll see though. Sleep: Just peeing a lot and struggling for comfort. I also got my first calf cramp (Charlie horse) the other night. Never had one in my life until then and it was sore for 3 days. Best Moment This Week: Another ultrasound of course! Doctor appointment update below. Miss Anything: being able to exercise. I’m currently still on pelvic rest but I’m hoping at my next appointment they may take me off. Movement: Still kicking like crazy and she was flipping around in my ultrasound this morning. Nolan has felt her kick a handful of times now and watches her move around in there. Cravings: Weirdly, I don’t think I’ve really craved anything this week. Symptoms: little bit of heartburn, little bit of nausea in the mornings again, some round ligament pain… nothing too crazy or out of the ordinary. 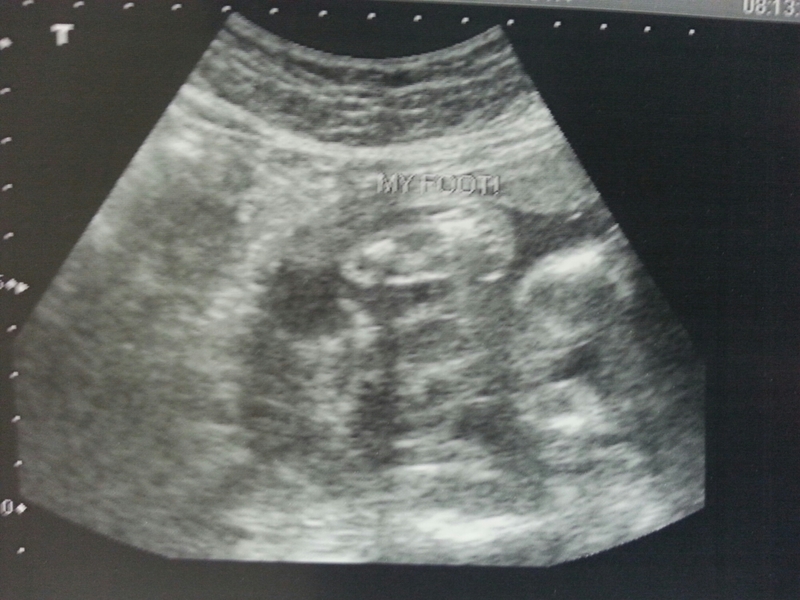 Noteworthy Moments: I had another doctor’s appointment and ultrasound today. Whitlee weighs approximately 1.25 lbs, which is right on track, and her heartbeat was 160! I saw her breathing and she even yawned once. 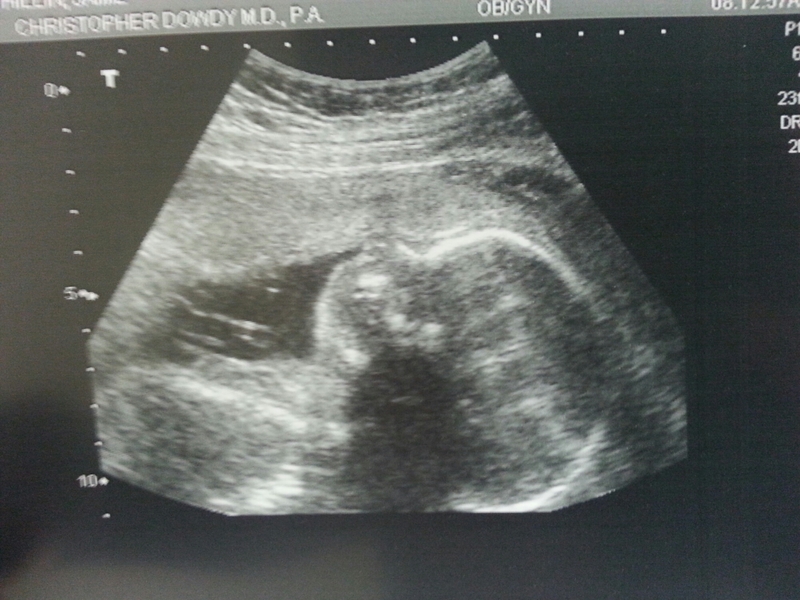 I got pictures of her profile, which I though looked basically the same as 20 weeks, but after comparing them at home – she has grown for sure, got pictures of her face and one of her foot, which she kept kicking up around her head. She’s head down right now and I’m hoping she stays that way! My fluid looked good, cervix looked good and they checked on my placenta. The tech said my placenta looked like it had moved up a little so I was excited to see my doctor afterwards and see what this meant for us as far as delivery goes. Unfortunately, my doctor got called out for delivery and wasn’t able to see me, so my nurse measured my belly and talked to me a little. 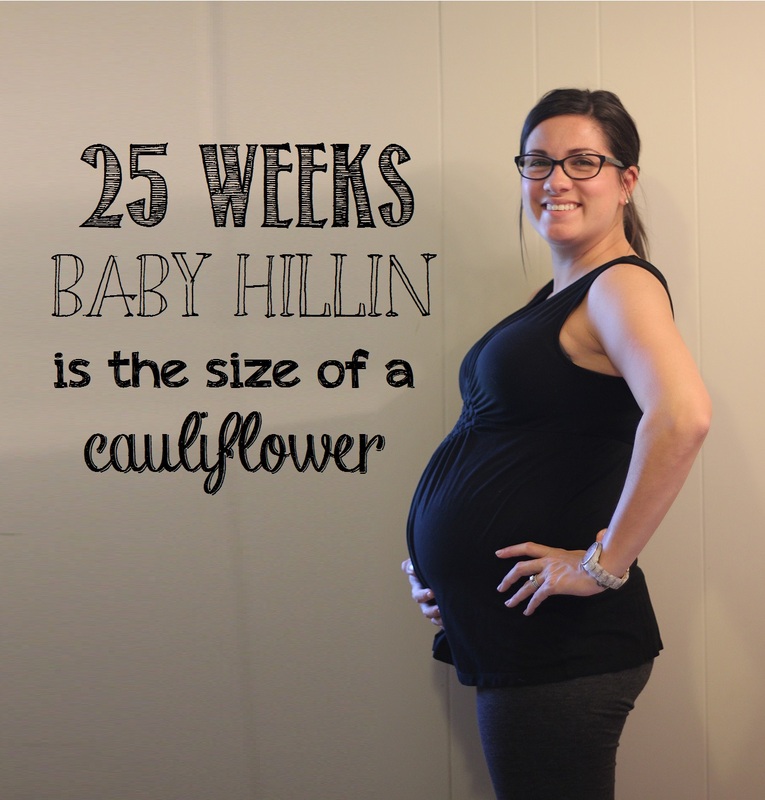 My belly is measuring 24 cm so we’re right on track there too. She said my placenta has moved and it’s currently 2.5 cm from my cervix. She couldn’t tell me much else since she isn’t the doctor, but I researched it quite a bit after I left and from what I can tell, 2 cm distance between placenta and cervix seems to be a fairly common cut off for vaginal delivery vs. c section and 3 cm is ideal, so at 2.5 cm, we’re looking pretty good. My doctor may have her own preference for what she deems a safe delivery, so hopefully we’ll get to talk about it at my next appointment. I go back in two weeks for my Glucose Tolerance Test and another regular appointment. Fingers crossed I get to talk to my doctor this time… I haven’t seen her the last two times! 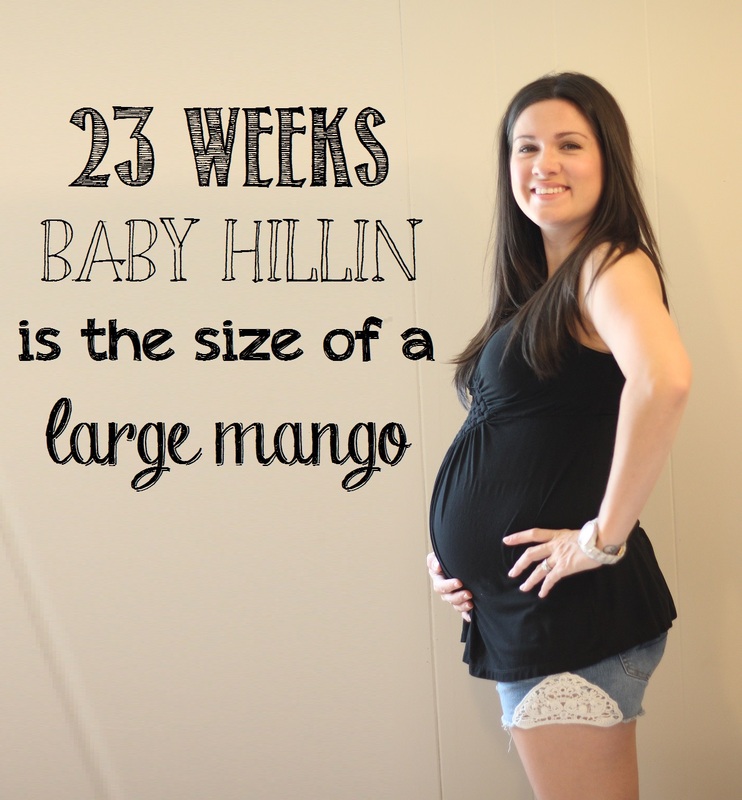 Baby is the size of a(n): large mango – yum! I love mangos! Weight Gain: 14 at the doctors office (11 weeks forward) and 20ish at home. Maternity Clothes: Motherhood has their maternity leggings on sale right now for Buy One Get One Free so I went this weekend and got a couple of pairs. I also got two more shirts that were Buy One Get One 50% Off… anndd I had a 20% coupon – so I ended up getting out of there at almost a 50% discount. The leggings are so comfortable. I don’t even feel like I have any pants on! Wedding Rings On or Off: On… I think the end is near though. My hands are so swollen in the evenings and my rings get really tight. It’s starting to make me a little nervous that one day I might not get them off. A friend of ours had to have hers cut off because she swelled so bad and it set in sort of fast. Sleep: Same ol’, same ol’… peeing 3-4 times a night and not very comfortable. Best Moment This Week: Catching a kick on video finally! Miss Anything: a good nights sleep… I should prob kiss those goodbye for about 3 or 4 years! Movement: Still kicking like crazy at night. Any time I wake up to go to the bathroom, she’s kicking away. She gets especially active about 10 PM. Cravings: flaming hot Cheetos and more Mexican food. Symptoms: swollen hands and feet in the evening, and the dark line on my belly is getting more prominent. I kind of like it – as long as it doesn’t get much darker. Noteworthy Moments: Nolan is finally seeing her and feeling her kick pretty regularly. I stopped really telling him when she was moving for a while because I swear he thought I was full of crap that you can see her move from the outside. But a few nights ago, I guess he was watching my belly and I didn’t know. I glanced at him when she started kicking and he said “I just saw her.” “And I just saw her again!” So he believes me now. Plus I caught her on video. I’ll try to post it soon! I think today was the first time she really kicked because of him though. He was laying his head on my belly and Whitlee wasn’t kicking at all. But he started talking to me and as soon as he did, she started kicking like crazy! He felt her kick him in the head. I think she recognizes her daddy’s voice! 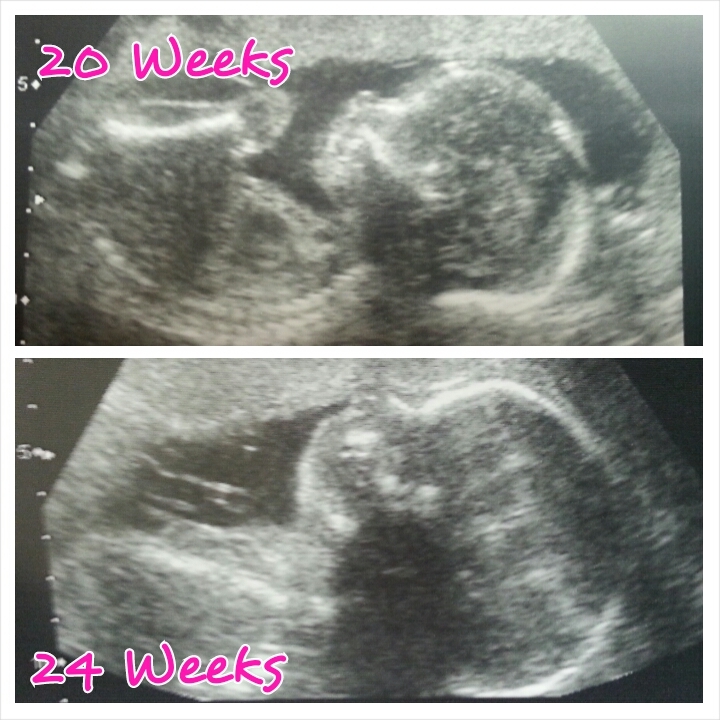 Weight Gain: 14 at the doctors office (11 weeks forward) and 20 at home. So I guess I gained 6 lbs in the first 11 weeks. I asked the doctor today if these numbers were okay, and she said that because I was pretty small to begin with, I’ll gain a little more than most. I’m okay with that! 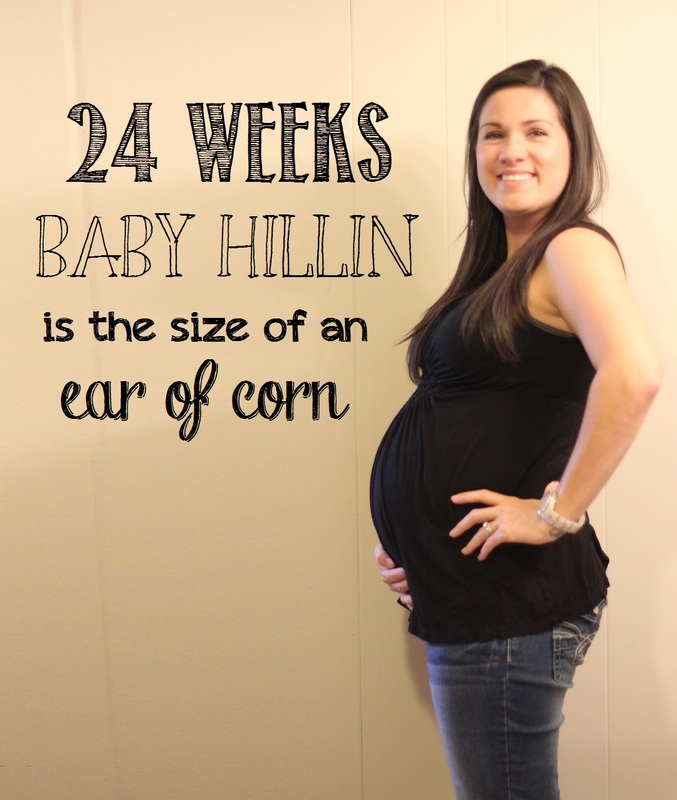 Maternity Clothes: Yup. Still holding out for fall clothes. I also had to swap to a maternity black tank in my weekly pics… my old faithful black tank was stretched to the max and I think it was making me look bigger than I really am. Stretch Marks: none yet. If they’re coming, they’re near. My belly feels so stretched sometimes. Sleep: Still just so so. I had a four day weekend last weekend, so that was pretty nice. I slept in and got plenty of naps. Miss Anything: walking normal.. I’m walking a little weird. I think it’s because my feet hurt. Movement: Still kicking like crazy at night. I’ve been watching her bounce around in there and I’m trying constantly to get it on video. No luck yet! Symptoms: noticing my feet are a little swollen after a full day of work. I think that’s pretty normal though, as long as it’s not severe swelling. Noteworthy Moments: I had a checkup today and got to hear Whitlee’s heartbeat. It was 153 this time and LOUD – loudest I’ve heard it yet. I guess it’s because she’s getting bigger. I let them know at my appointment that my contractions were much better and they liked that. I go back in two weeks for another appointment and ultrasound to check my placenta. I’m glad I get to see her a few more times before she gets here. 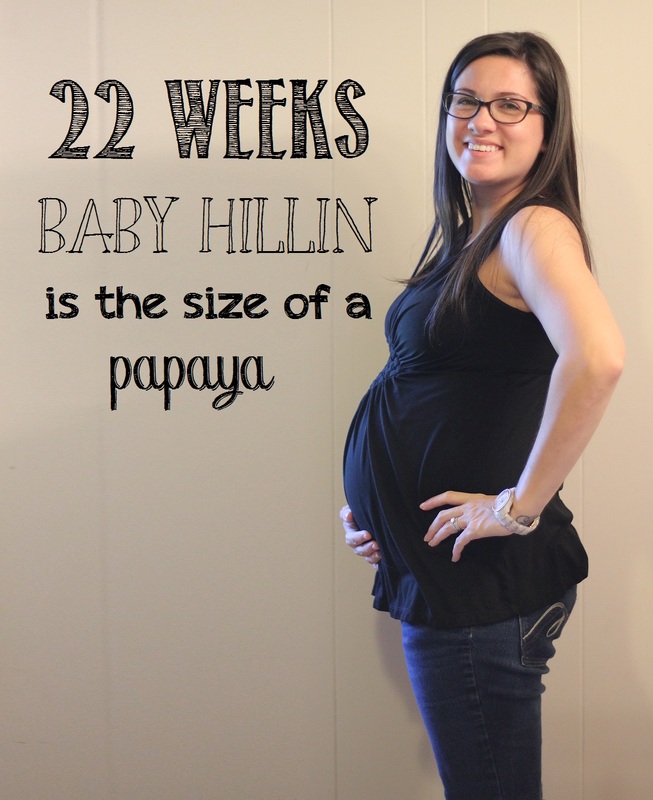 I also found out that even with the placenta previa, if we have to have a C-section, she still likes to get as close to 39 weeks as possible. I’d read that most doctors will do them at 37/38 with previa and that would have put her here the week of Christmas. I like the idea of after Christmas a lot better. Of course, I like the idea of a natural birth whenever she’s ready to come on her own better than anything, but we’ll do what we have to do. Also, Nolan took her crib to work with him Friday and had it painted. We went back and got it this weekend and it is perfect. I’m so in love with it! We spent our Saturday night putting it together. My how times have changed! 🙂 But.. let me refresh your memory a little – this was a hand me down vintage Jenny Lind crib. It came to us taken apart in four pieces (5 with the mattress support) and a ziplock full of hardware. Absolutely no instructions… and of course, the manufacturer went out of business a long time ago, so the manual wasn’t online anywhere. I was able to check that it was not recalled, and we figured out it was originally a drop-side crib, which are no longer considered safe. So my handyman of a husband figured out the general concept of how it was supposed to go together, and then he figured out a way to make it a fixed side crib. It’s even sturdier than it could have ever been originally. I’m so excited to see it in her room! I think it deserves it’s own post as soon as its 100% finished. We still need to paint the hardware on it – right now it’s still brown to match the original crib and it sticks out like a sore thumb. One more belly pic. This was taken the other day. I’m loving maxi skirts – extremely comfortable!